The area under vineyard in British Columbia has more than doubled in a decade, reaching 9,066 acres (3,626 hectares) this year. Even though the pace of expansion is slowing due to a lack of suitable vineyard land, forecasts suggest that another 1,500 acres (607 hectares) will be planted during the next two years. This data comes from the latest vineyard census compiled for the British Columbia Wine Institute by Oliver consultants Lynn and John Bremmer, principals of Mount Kobau Wine Services. The numbers suggest a very dynamic wine industry but also one with marketing issues in the future. By 2012, when these plantings are mature, the industry will be able to produce about 23 million litres of wine, double the production of 2004. Until recently, most British Columbia wineries sold everything they made with ease, primarily within the province. In the future, it may not be so easy to sell all that wine at home. There are now 144 licensed wineries in British Columbia and 20 more grape wineries with pending licenses. That is up from 90 licensed wineries in 2004. In fact, the number of wineries and potential producers is higher. The census has omitted several fruit wineries recently opened or under development. It has not counted the three meaderies or the two rice wine producers and it has omitted several winery projects that will not open before 2010. A ballpark figure of wineries open or solidly under development is about 175. Some 84.3% of that acreage is in the Okanagan Valley, with 6.4% in the Similkameen Valley, 7.3% on the coast or Vancouver Island. The remaining two percent are in what the census calls “other” areas, including the Kootenays, Kamloops and the Fraser Canyon. 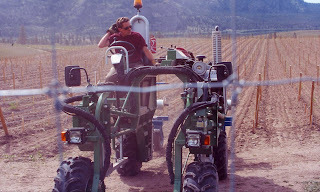 At least 100 acres have been planted in these other areas, as new or would-be vintners in British Columbia have begun to push the envelope. With global warming reducing winter’s severity and with hardier grape varieties, the prospect of wineries in locales such as Kamloops is becoming real. The census also tracks the grape varieties being planted. Red varieties account for 51% of the plantings. * Syrah plantings have more than doubled since 2004, to jump ahead of Cabernet Franc. * Pinot Gris has jumped ahead of Chardonnay for the first time since these vineyard censuses were begun. There is a big surprise in the just released annual report of the British Columbia Liquor Distribution Branch, covering the 12 months to March 31, 2008. Mission Hill’s Oculus, one of the most expensive table wines made in the Okanagan, is among the top 10 British Columbia VQA brands by sales volume. The 2004 Oculus, the most recent release, sells for $70 a bottle. In the 2007/08 fiscal year, the LDB sold $1,121,000 worth of Oculus. That’s serious coin. Clearly, Oculus has made a break through, winning a substantial following among top restaurateurs and serious wine collectors. Hats off to Mission Hill. Now Mission Hill’s flagship red, Oculus was first made in the 1997 vintage. Recent vintages showed a major step up in quality and complexity, with more of the Bordeaux red varieties going into the blend than was the case initially. The 2004 Oculus is a blend of 74% Merlot, 13% Cabernet Sauvignon, 10% Cabernet Franc and 3% Petit Verdot. When I tasted this wine last September, I scored it 94 points. With a higher percentage of Merlot than usual (the previous vintage was 47% Merlot), the wine is the richest Oculus so far and one of the finest that winemaker John Simes has made. Mission Hill’s decision to raise the price to $70 for the 2004 vintage very likely accelerated the sales of the wine. Earlier vintages sold between $35 and $50 a bottle, and sold relatively slowly. Mission Hill’s marketers scored with the psychology that drives wine collectors and high-end restaurant wine lists by giving the wine a premium price and luxury packaging. The soon to be released 2005 will sell for the same price. Mission Hill’s achievement is not just that it made a great wine but that it made a surprising quantity of it. The LDB’s sales figure suggest that about 16,000 bottles moved through the liquor stores alone; and the wine was also sold through other channels. Oculus is on the list because the 2004 vintage was the first one that Mission Hill sold through the LDB in volume. What is so remarkable is to see a $70 wine on a list with wines selling between $15 and $25. Sumac Ridge’s Gewürztraminer ($15) is Canada’s largest selling VQA Gewürztraminer and has had that ranking for quite some time. Mission Hill’s Five Vineyards tier of wines is slowly migrating to a new brand that the winery launched last year: Ganton& Larsen Prospect Wine Company. Look for these value wines under that label. Gray Monk and Burrowing Owl Pinot Gris both are long time favourites among those who love that white. The wines are quite different in style; Gray Monk’s wine is fruitier, with perhaps a touch of sweetness while Burrowing Owl is drier and more herbal. Both are exceptionally consistent. Jackson-Triggs and Burrowing Owl Merlot also are long-time favourites for Merlot lovers. The decline in Burrowing Owl sales likely is because the winery sold less through the LDB and more through other channels. The Quails’ Gate Chasselas/Pinot Blanc ($16.99) and the Gray Monk Latitude 50 ($13.99) are popular on many wine lists because the wines are very well made, affordable and food-friendly. The challenging cool and wet 2007 vintage on Vancouver Island put all the wineries to the test. The Saanich Peninsula’s Starling Lane Winery mastered that challenge well to release remarkably-crafted wines. The couples are all gentleman farmers who are retired, or nearly retired, from various professions. They all planted two-acre vineyards in the 1990s. When they could not get a decent price for their grapes from a large winery, they formed their own winery. 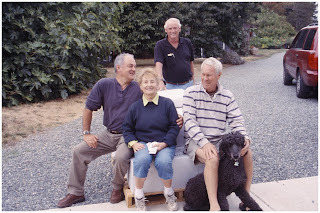 The Begbie farm is owned by Victoria radiologist John Wrinch (who is the winemaker) and his wife Jacqueline. The other partners are Jerry and Sherry Mussio and Ken and Susan Houston. The skills of the six partners are conveniently complementary. Sherry is an artist who designs the labels; Susan does the books; Jacqueline runs the tasting room; Ken manages the cellar and Jerry does much of the marketing. Each couple looks after postcard vineyards planted carefully with varieties that can ripen on the Saanich Peninsula. Pinot Noir is the only variety that really struggled here in 2007. Even with a very low crop on the vines, the berries did not get ripe enough to yield table wines as fine as the prize winners made in the two previous vintages. Starling Lane found a silver lining in this, turning its Pinot Noir into a classic sparkling wine. I have been impressed with Starling Lane’s wines every since the winery opened. The current releases, mostly from 2007, do not retreat from the standards the partners have set for themselves. Because production is so tiny, most of the wines are sold out but they may be encountered in a few Victoria area restaurants. Pinot Noir 2006 ($25). This dark wine begins with aromas of chocolate and black cherries. On the silky palate, there are flavours of vanilla, strawberry and cherry. The wine is rich and satisfying and unexpectedly big for a Vancouver Island Pinot Noir. 88+ points. Only 100 cases were made. Pinot Blanc 2007 ($19). With the most tangy acidity of Starling Lane’s 2007 whites, this wine demands a plate of oysters. The wine begins with aromas of melons and shows green apple flavours. It has a clean, crisp and tangy finish. 86. Only 31 cases were made. Pinot Gris 2007 ($19). This wine has the bouquet and taste of citrus, lifted by an alluring spiciness (possibly from a subtle use of oak barrels). The finish is clean, fresh and dry. 88. Only 68 cases were made. Ortega 2007 ($19). This white is arguably the flagship variety on Vancouver Island because it ripens reliably to produce a fruity wine that – like this one – reminds one of Sauvignon Blanc. This wine begins with aromas of herbs, flowers and melons. On the palate, there are zesty grapefruit notes. It finishes with a refreshing crispness. 89. The winery made 142 cases. Not tasted is the winery’s 2007 Maréchal Foch and its Blackberry Dessert Wine. Previous vintages of these two were among the best on the island. Screw caps and juicy-tasting wines: is there a relation? Several years ago, Blasted Church Vineyards switched entirely to bottling all of its wines under screw cap. This was done because the winery’s owners and their winemakers agreed on the importance of avoiding the issue of cork taint. Only a small percentage of wines ever develop that mustiness that is called “corked” but those wines reflect poorly on everything a winery releases. Screw cap closures, while not without problems of their own, at least eliminate cork taint. But more importantly, they are better at preserving the exuberant fruity aromas and flavours of young wines. A year or two later, when those bottles are opened, the aromas and flavours are still fresh and attractive. I believe the closure is one reason why the 2006 Blasted Church Syrah just won a Lieutenant-Governor’s Award for Excellence. I tasted the wine at the winery this spring. Then as a member of the judging panel in the LG Awards, I tasted it blind. My notes were similar and my score exactly the same (88). The wine is medium-bodied for a Syrah but it wins with lovely aromas of cloves and cinnamon and pepper, nicely preserved by the closure. Recently, I have tasted several new releases from Blasted Church. All show the benefit of their closure, to say nothing of good winemaking. This winery, located near Okanagan Falls, has had more than its share of winemaker turnover. The original winemaker was replaced when Chris and Evelyn Campbell, in 2002, bought what was then a two-year-old winery. 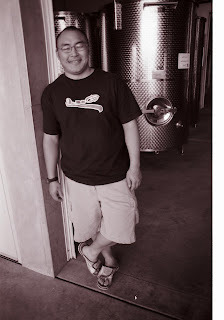 Their first winemaker, Frank Supernak, died that fall in a tragic accident. The winemaker who did the 2003 vintage was a promising young South African who could not get his work visa extended. The winemaker who did the 2004 vintage left the following spring after a falling out with the owners. Kelly Moss, formerly a winemaker at Calona Vineyards, joined Blasted Church to do the 2005 and 2006 vintages before moving back to her Ontario hometown to raise a young family. 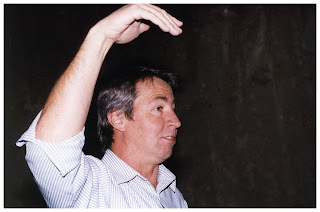 The 2007 vintage was done by Australian-trained Richard Kanazawa, a one-time cellar hand at Domaine de Chaberton and then winemaker at Red Rooster. He looks like a keeper, if only because he revels in working at a winery that grows nearly all of its own grapes. It is an ideal situation when the winemaker can ask the vineyard manager for the kind of favours that permit him to make good wine. For example, Blasted Church grows both Chardonnay and Chardonnay Musqué. Often, the two clones mingle together in the vineyard. Richard gets away with asking that the Musqué clone be picked separately so that, in the winery, its spicy personality is not diluted by the broader flavours of the other Chardonnay. Blasted Church 2006 Merlot ($25.99). I tasted this wine in the spring and again recently and noted a superb bottle development occurring. The wine is lusciously seductive in texture, with aromas and flavours of blueberries, blackberries, cherries and plums. The wine has good weight on the palate. It also develops in the glass, with the result that my point score climbed from 88 to 90 as the wine was being enjoyed with a meal. In every wine, I believe that the closure did a brilliant job at retaining the fundamental flavours and aromas of the grapes that Richard and Kelly captured in the winery.